Even Chan’s baby chick can see right through his efforts to hide from his growing feelings for Seo-ri. Woo-jin also finds his thoughts constantly filled up with Seo-ri, but for even more complicated reasons than his nephew. Seo-ri finally finds a job that will help her pay for her violin, but that job makes it that much more difficult for Woo-jin to avoid her without being cruel. Woo-jin’s just not sure what to do when his worst memories and his best memories are so closely intertwined with one another. Chan gets a call from Hee-soo, who asks about the woman staying with them. Chan confirms Seo-ri’s classical music qualifications, so Hee-soo calls Seo-ri next to invite her to the office. While rowing, Chan’s chest is itchy again. He drops an oar in the water as he realizes the cause: Chan has feelings for Seo-ri. Seo-ri confirms to Hee-soo that she is the one who took Tae-rin’s note earlier, so Hee-soo offers her a job working on the music festival project. Woo-jin arrives just in time for Seo-ri to announce her new role as his coworker. Woo-jin takes Hee-soo to the roof to try to dissuade her, but he struggles to explain why he doesn’t want to work with Seo-ri. Hee-soo can’t understand why Woo-jin, who doesn’t care about anything at work, seems to hate Seo-ri. 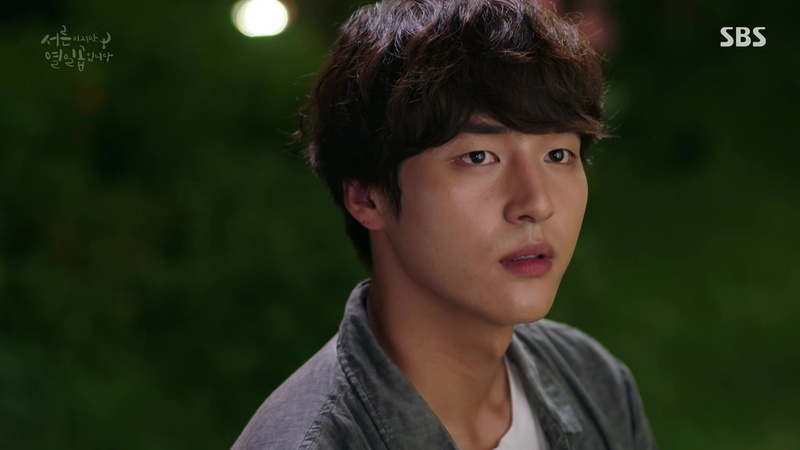 While he can’t bring himself to tell Hee-soo, Woo-jin thinks back to his tearful talk with Dr. Yoo and knows it’s not hatred, but fear of his memories that is driving his protests. Since he won’t explain to Hee-soo, she stands her ground to keep Seo-ri. Meanwhile, Seo-ri is elated to be working alongside her friend, and even suggests to Woo-jin that he was the one who vouched for her to Hee-soo. She tops it off with a joke and tells him she put fountain water in the water pitcher, but she gets no response from Woo-jin. She assumes that he just doesn’t like goofing off at work. Seo-ri eagerly commits to her work, her notebook in hand to jot down everything from her classical music segment assignment to the broken handle on the break room door. She catches everything, even the precise time that Woo-jin left the office. Hee-soo is upset that Woo-jin left work so early when he was supposed to finish a project by the end of the day, but Hyun takes a peek at Woo-jin’s desk and reports that the job is already done and done well. Tae-rin calls the office and is further impressed when Seo-ri knows the details of some additional inspiration suggestions she offers. Tae-rin invites the whole office out to attend her concert the next evening, Seo-ri included. As she hangs up, Tae-rin realizes she still doesn’t know Seo-ri’s name. Seo-ri tries to relay Tae-rin’s ideas to Hee-soo, but Hee-soo tells her that she’d prefer that Seo-ri just work on it herself with Tae-rin and just let the company know what she decides. And where has Woo-jin ducked off to? He’s returned to the bridge where he saw Seo-ri last night. Ghosts of his past overlay the scene, as he envisions himself when he was younger visiting the exact spot, and young Seo-ri and older Seo-ri overlap in his memories. The sound of a bike bell, Seo-ri’s charm, these images and sounds overwhelm Woo-jin and he begins to panic again. Woo-jin’s phone begins to ring and he drops it on the ground as he turns and bumps into someone on the street. The call is from the office, and when he finally manages to pick up, it’s Seo-ri calling. She tells him about a meeting the next day and offers to walk home together if he’s headed back to the office to pick up his car. Woo-jin gruffly tells her to just go home by herself. At home, Jennifer is unprepared for the room full of balloons Chan has set up to congratulate Seo-ri on her new job. Chan blows a party favor horn as Seo-ri walks through the door, and then sticks one in Jennifer’s mouth so that she can add her more stoic cheer. Chan makes his way to bed in the best of moods, but feels judged by his baby chick who chirps loudly at him. He tries to talk out his feelings with the chick, and he swears that he only cares for Seo-ri as someone who needed a home, just like the chick. No one is convinced, Chan. While Chan wrestles with his new feelings, Woo-jin spends the night soaked in old ones, reliving the accident over and over again while huddled on his bedroom floor. Seo-ri folds socks and brainstorms ideas for the music festival late into the night, when she hears a door close. She peeks out of her room, but doesn’t see that it’s Woo-jin leaving early for work to avoid her. Early the next morning, Seo-ri finds a gift from Jennifer, a new pair of shoes to congratulate her on her new job. Chan is also awake, and surprised that Seo-ri is headed into work before the buses even start running. Seo-ri plans to walk, but Chan says that he always gets up this early to ride his bike and offers her a ride. Seo-ri notes a Pororo sticker on the bike frame, and this triggers a memory. Seo-ri recalls chasing after an individual, one who looks very much like young Woo-jin and is carrying an art tube with a Pororo sticker on it. Seo-ri tries to hold Chan at the waist, but he breaks out in a fit of ticklish giggles. So instead of the waist, Seo-ri holds his pockets while he bikes. The wind whips Chan’s hair and he smiles as they start going downhill. But Seo-ri panics at the speed and tugs hard at Chan’s pockets, stretching them across his groin painfully. He begs her not to hurt his crotch as they both yelp down the rest of the hill. Once at work, Seo-ri discovers that Woo-jin has come in early, already held the work meeting, and left without anyone at the company seeing him. Hee-soo seems to be catching on that this new behavior seems to be a result of Seo-ri joining the team. One person is excited for Seo-ri’s help though, and that’s Hyun, who enjoys being called a “senior” and having a very diligent coworker who takes the best notes. He wants to celebrate by taking Seo-ri out for a welcoming party. Everyone heads out for meat and drinks, except Woo-jin, who is taking some reference measurements and shots for a design in a park. Hee-soo asks if it’s difficult to live with Woo-jin, but Seo-ri is just grateful and describes him as kind, words Hee-soo is not used to hearing in the ten years she’s known Woo-jin. This piques Seo-ri’s interest, and she learns that Hee-soo went to college with Woo-jin in Germany. Seo-ri recalls Woo-ijn’s moment of panic in the intersection, and realizes that this is her chance to ask a longtime friend of Woo-jin what that was about. She starts to ask, but hesitates and trails off instead. Woo-jin gets a call from Chan and the boys, who just want him to come home and eat food with them. Woo-jin is distracted by a blurry shot of Seo-ri amongst his photos on his camera. Chan worries about his uncle’s behavior and asks him if anything’s wrong, but Woo-jin avoids the question and says he’ll see him at home. Woo-jin realizes the Seo-ri photo was taken during their Choco Pie encounter, when she jumped in front of his camera. His thumb hovers over the delete button, but he hesitates as he recalls his memories, both from thirteen years ago and more recent, and Dr. Yoo’s recommendation to disassociate Seo-ri from the girl from thirteen years ago. The camera swings out, Woo-jin’s finger still hovering over the button. Chan is out pumping iron by moonlight, and that moonlight prompts him to call Hee-soo to admonish her for working her new employee so late. Hee-soo tells him they took her out for drinks, and Chan jumps in concern at the thought of Seo-ri drinking. Drunken Seo-ri has made her way to the violin repair shop to gaze at her violin and ask it to focus on getting well while she works hard. Seo-ri starts to stumble home but is distracted by a man singing a song about being seventeen, and that’s where Chan finds her, bumbling through the confusion of being thirty. Seo-ri doesn’t spot him, and Chan decides it’s kinder to follow behind at a distance rather than embarrassing her. So he follows Seo-ri through a playground and down the streets while she swings her arms like she used to when she was younger. When she stumbles toward a sign, Chan deftly flings his flip flop at it and knocks it out of her way. Seo-ri jams at the door lock and manages to let herself inside the house with no further intervention, impressing Chan. As Chan sighs about all the adults in the house he has to take care of, his baby chick chirps at him in his room in what he perceives as further judgment. Woo-jin finds his way home shortly after and heads out to the garden. His solitude is interrupted by Jennifer, who feels talkative in the moonlight. She mentions how quickly it seems they went from cherry blossoms to summer, but Woo-jin says he wishes he could speed through time to a month later. Jennifer promises that painful times fade at their own pace, and warns that by trying to ignore everything, people can miss out on all of the good things happening too, and regret comes too late to change anything. This reaches Woo-jin, but while he’s now ready to talk, Jennifer excuses herself for bed and leaves him alone in the garden. Not the room under the stairs, but her old room, now occupied by Woo-jin. Seo-ri doesn’t even notice him sleeping there as she climbs in from the foot of the bed. Seo-ri wakes up the next morning face to face to Woo-jin. She assumes such a strange situation could only be a dream. She blows on his face, and that rouses him. She reaches out and gently smacks his face, and his eyes open wider. “This is a dream,” she says. “I don’t think it is,” Woo-jin deadpans back. Seo-ri jumps up once she realizes she’s in the wrong room, and then scrambles into Woo-jin’s closet when she hears Chan coming. Chan wants to borrow his uncle’s cologne and grey shirt. Just as he begins to open the closet door, Woo-jin tells him the shirt is in the laundry, and Chan misses Seo-ri huddled on the floor. Seo-ri remains in the closet, where she notes the gifted plunger now tucked into the back, next to a familiar Pororo-adorned art case. Woo-jin opens the door once Chan is gone and asks why they didn’t just tell Chan the truth. Seo-ri asks about the hidden plunger, which Woo-jin dismisses. Once Seo-ri leaves, Woo-jin shoves the plunger back into the closet. He’s still thinking about his chat with Dr. Yoo, and how he feels like Seo-ri keeps bringing up memories he doesn’t want to recall. Seo-ri heads downstairs in a daze, where Chan asks if she just washed up and offers her a ride to work again. Seo-ri staggers off, saying that work doesn’t want her to come in that early. Miss Yellow Shoes is still stalking around the outside of the house. Jennifer starts to suspect someone watching her as she walks out for groceries, but doesn’t spot the woman lurking. At the design studio, Hyun wants Seo-ri to listen to some music Tae-rin sent them. He grabs Woo-jin’s earbuds and plugs them in, but Seo-ri discovers that in addition to never being plugged into anything, they’re also broken. Hyun rushes to his car to get his own headphones, just as Woo-jin arrives at the office. Woo-jin grabs his earbuds and turns to leave again, but Seo-ri stops him to ask why he carries around broken earbuds. Woo-jin responds that they aren’t close enough for him to explain everything about himself to her. He reminds her that they won’t have to see each other for that much longer, so there’s no need to get closer. With that, he’s off. On the rooftop, Seo-ri recalls each moment when Woo-jin seemed to be opening up to her, and those actions don’t match up with his words speaking to their distance. Seo-ri stops by the break room, surprised to see that Woo-jin is back already. She fumbles and tries to flee, but she grabs at the broken door handle and the door slams shut, locking them in. Minutes pass, and Seo-ri bumbles into things in her panic, while Woo-jin remains completely calm and says nothing to her. Hyun notices the shut door and lets the two out. While Seo-ri is a bundle of nerves, Woo-jin saunters out as if nothing happened. Hee-soo tells Woo-jin to take Seo-ri to Tae-rin’s concert later while she and Hyun check on things at the manufacturing plant, but Woo-jin makes up an excuse to go check out a local flea market. Seo-ri runs outside after Woo-jin to ask him what she’s done wrong. Whatever it is, she wants to apologize and fix it, and also to let him know that she sees him as her friend and hopes that they can stay close even after she moves out of the house at the end of the month. She insists that they are close, perhaps the closest of all the new people she’s met. Woo-jin says nothing and drives away. While at the plant, Hee-soo receives a distressing call and tries to contact Woo-jin. When she can’t, she calls Seo-ri at the office and tells her there’s a problem with a stage for a show and they need to repair it fast. Seo-ri remembers the market Woo-jin said he was heading to and goes there herself, not even taking time to release her computer mouse from her hand. She spots Woo-jin in the crowds but can’t catch up, and gets the idea to page him overhead when she hears an announcement for a lost child. She and the announcer miscommunicate as she tries to indicate that her lost “child” is a thirty-year-old adult. Seo-ri can be heard overhead asking if Woo-jin is out there measuring things, and this tips off passersby to Woo-jin. Eventually, Woo-jin sees all the people staring at him and realizes someone is calling for him. They rush to meet Hee-soo and Hyun at the damaged stage. A repair is made. But the material used is different, and this material is slippery, which they discover when Hyun flips and falls, and Seo-ri subsequently slips and falls into Woo-jin’s arms trying to help him up, ha. While everyone argues over the loss they would experience if they have to cancel the show, Seo-ri hears an orchestra rehearsing and rushes in to ask for some rosin. She brings the rosin back and they scrub it all over the slippery spot, and problem solved. Seo-ri scrubs so hard that she cuts her hand, but she keeps scrubbing away anyway. Now it’s time to rush over to Tae-rin’s concert. Because Seo-ri was added at the last minute, someone in the group has to sit alone. Seo-ri starts to take the ticket, but Woo-jin volunteers instead. Seo-ri is overcome with emotions while she watches Tae-rin play. She recalls the moment that her mother passed down her violin to her, how she promised her mother she would live out her dream for her. Seated behind her, Woo-jin can see the tears falling from Seo-ri’s eyes. After the concert, Tae-rin finally has the opportunity to meet Seo-ri. Seo-ri avoids shaking her hand, ashamed of her dirty and bloodied fingers. Tae-rin finally asks her name, and realizes immediately who Seo-ri must be. In her dressing room, Tae-rin recalls the moment that Seo-ri was selected to join the orchestra Tae-rin was in. She wonders what Seo-ri is doing working at a design company. The rain pours down as Woo-jin drives Seo-ri home, and he watches out of the corner of his eye while she fidgets with the cuts on her hand. Chan is relieved to see Seo-ri finally home, but then worried when he sees her hurt hand. She shrugs it off and rushes for bed, but Chan looks around for medicine to help. They don’t seem to have any in the house, so he rushes out into the rain, umbrella flipped inside out in the wind, trying to find a pharmacy that’s still open. He returns successful, soaking wet, but Jennifer is already tending to the cuts while Seo-ri sleeps. Dejected, Chan heads to his room, where he admits to the chirping baby chick that his feelings for Seo-ri are indeed different than the ones he has for the chick. Woo-jin broods in his room, his thoughts also on Seo-ri. He recalls Dr. Yoo’s recommendation, to think of a happy experience anytime Seo-ri and the accident pops into his head. Seo-ri stays up to peel onions, but it’s clear that they are a front to disguise her very real tears. She reaches up to brush away her tears, but Woo-jin is there to stop her before she gets onion in her eye. Woo-jin reaches out to tenderly cup Seo-ri’s cheek, and he recalls his answer to Dr. Yoo’s advice. The happiest times in his life are the same as the most terrifying—the times spent with Seo-ri. Woo-jin holds Seo-ri’s face in his hands as the rain falls outside the window. Woo-jin, you surprise me every episode in the very best ways. Woo-jin is a cold character, but he’s different from the typical rich, lonely boy. He’s so obviously driven by fear, and because at his core he is a caring person, he can’t help but slip up and be kind to Seo-ri all the time. Even so, I’m always surprised with how quickly Woo-jin seems to come to terms with things. He knows that Seo-ri is triggering the worst memories that he has, but he doesn’t stay in denial too long and pretty quickly admits that Seo-ri is also making him recall his happiest memories as well. What will this poor boy do when he discovers that she really is the girl from his past? I’m starting to trust that he will be patient and kind and work through it. We’ll see. Woo-jin might not see yet that he’s becoming Seo-ri’s family though. He may see his kindnesses as small gestures, but she sees everything as a huge demonstration of affection, because right now she has no one else other than these guys who stumbled into her life. She knows better than anyone that her time is running out in the house, and she doesn’t want to go back to being completely alone. And without knowing Seo-ri’s background at all, Woo-jin can’t begin to understand how much of a new beginning this month has been for her so far. The feelings that Woo-jin are developing for Seo-ri don’t feel rushed when you think of it as a continuation of the feelings he felt when they were both younger. Woo-jin doesn’t know who Seo-ri really is, but he can’t help but feel that exact same pull because she absolutely is the very same person from his past. And now we’ve seen that Seo-ri may have known him in the past too, not just that one meeting on the bus. Of course these setups are always a little convenient, but I want Seo-ri to have stakes in realizing the truth as well. These are feelings that didn’t have a chance to run their full course, so I can imagine how intensely he might feel about her without understanding why. And then Chan. Oh Chan, you sweet boy. The worst of it isn’t so much that Chan is headed for heartbreak, but his maturity ensures that even he is well aware how ill-fated it is. Even so, perhaps we can count on that same maturity to help him through his eventual heartbreak without too many bruises. It’s easy to understand how Chan could fall for Seo-ri. He and Seo-ri connected over so many sweet moments this episode. The bike scene was simple and sweet, a scene for two seventeen-year-olds, and ended with a hilarious twist. Even after having his loins mangled a bit, Chan was willing to give Seo-ri a bike ride the next day. The show is just full of a bunch of big-hearted goobers, and I love them all for it. Things are still moving slowly in the plot department, for sure. But I’m not convinced that it’s a bad thing at all. One of my top pet peeves with dramas are ones that rush through all of their material in the first few episodes and then have to meander through things that don’t matter until they finally get to lie down and die in the finale. Here, we’re taking time to get to know the characters, to build up our love for them, so that when the show finally drags them through some emotional stuff, we’re primed for it. It’s the little things that I think are going to make this show meaningful. I really enjoyed that they started prepping us for Seo-ri to end up mistakenly in Woo-jin’s bed a while ago. Foreshadowing earlier in an episode, fine, but foreshadowing several episodes before? Guaranteed to get a, “Oh man, that’s right!” from me. And the hints that Seo-ri might know more about Woo-jin than even he previously knows, all centered around the Pororo sticker on the art tube, are great. I love when seemingly innocuous background objects become meaningful in a big way later. The key is the slow build, and I think the show gets that. That said, I’m ready for some complications next week.